Sherita and Rodney met through their jobs with the government. They initially went out as friends until they found they enjoyed each other’s company so much they started dating. They kept their office romance mostly a secret until Rodney proposed after a trip to Florida. During the trip, Sherita actually had to leave early due to a family emergency, and Rodney spent the time shopping with his sister who lived there and selected an engagement ring. He proposed once they were back home together. The couple had been engaged since 2016 and went through several planning processes. Rodney always knew he wanted a destination wedding but Sherita was on the fence about it. They began looking into resort options abroad with their Destify agent Melissa and also researched local weddings too. They even placed a deposit on a riverboat venue in Virginia but requested a refund after they saw the sky-high prices for local catering costs. After that was canceled as if on cue, the couple saw a commercial for Sandals Royal Caribbean in Montego Bay, Jamaica and realized it was the resort for them. Sherita originally thought the entire process would be too difficult to pull off but found that Melissa was always willing to provide or find any information the couple needed. 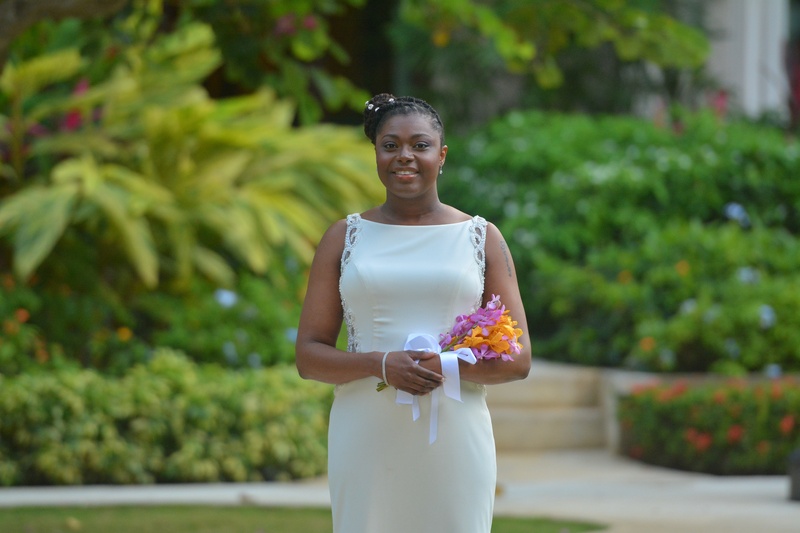 They loved that by booking their wedding at Sandals they were provided a worry-free process. After having their website created in a day, they were set. Sherita said, “I know we were tough but Melissa hung in there.” They knew that by having a destination wedding the costs were upfront and there wouldn’t be any lingering debt afterward. The wedding turned out to be the perfect way to cut the guest list in size, as only a certain amount of those invited were able to come. The resort truly made the couple feel special, they said, “The resort made us feel like King and Queen.” The on-site wedding department was wonderful to work with, on top of their game, answering every question. Sherita loved her makeup artist and final hairstyle. They held their ceremony at the resort’s beautiful gazebo. For the rest of the time, the destination wedding turned out to be a huge vacation with their closest loved ones and friends. The couple felt like the service was truly personal, and loved all the attention they got across the resort. They said everyone they encountered during the entire process was excellent. They felt so relieved the day after their wedding, that they were married and that was that. The couple now recommends anyone have a destination wedding, due to the simple process and how affordable it all was. They felt like they got every dollar’s worth. For advice, they recommend future couples give your guests at least a year’s notice, so they have more time to book and make payments affordable. Looking at our photos some people might think they’re fake because they’re so gorgeous.